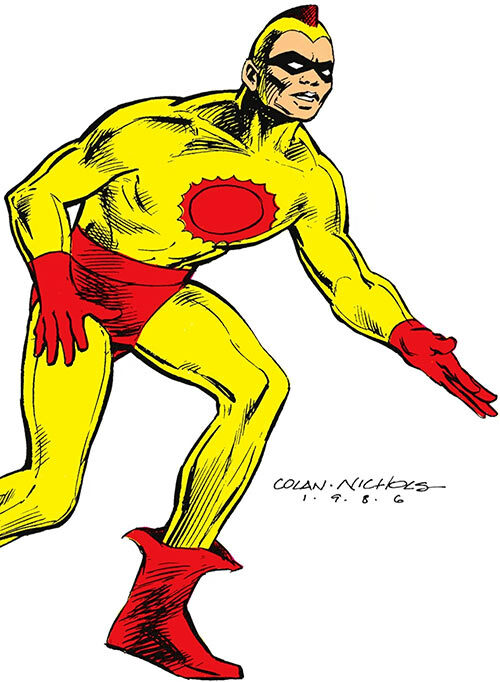 Wing was the sidekick of an early DC Comics hero, the Crimson Avenger. He thus appeared in 1938. With the Avenger being very… comparable to the Green Hornet, Wing was a Kato expy . This entry isn’t a full article. It was part of a small series that ran then-hard-to-find stats from Mayfair’s World at War sourcebook, plus stock Who’s Who information for context. Group Affiliation: All-star Squadron, Seven Soldiers of Victory. Wing is a superb hand-to-hand combatant with great expertise in the Chinese martial arts, as well as a well-trained agent. Before coming to the United States, Wing lived in Hankow, China. In New York City in 1938, he became the chauffeur of Lee Travis, the young publisher of the Globe Leader newspaper. Wing was deeply concerned about the recent conquest of much of China, including Hankow, by Imperial Japan, in which three million of his fellow Chinese had died. As a result of his conversations with Wing on this subject, Travis began to feel that he himself should do more about the war in Asia. On Sunday, October 30, 1938, Wing drove Travis to an Halloween costume party in New Jersey that was being held to raise money for Chinese victims of the war. Travis was dressed as a masked highwayman for the occasion. The party was interrupted by costumed thieves. One of these murdered Claudia Barker, an acquaintance of Travis. The thieves escaped with the charity proceeds for the Chinese. Travis, still in costume, and Wing, driving Travis’ limousine, together went in pursuit of the criminals. With the aid of a farmer, Travis and Wing overcame the thieves and left them for the police. Travis decided not to reveal he was the masked man who had gone after the thieves. Rather, he decided to continue wearing the costume to fight criminals as the Crimson Avenger. Wing, who also became Travis’ valet, served as his confidante. The Crimson Avenger eventually adopted a different, more super-heroic costume, and finally Wing wore a costume of his own, which he wore when going into action as the Crimson Avenger’s crimefighting partner. Wing became an unofficial member of the team of costumed heroes known as the Law’s Legionnaires (aka the Seven Soldiers of Victory). He also served as a member of the wartime All-Star Squadron. The Crimson Avenger was himself a member of both groups. Wing finally sacrificed his life by heroically detonating a powerful weapon called the nebula-rod in order to defeat the strange menace called Nebula-Man. However even his sacrifice could not prevent the Soldiers from being scattered through time, from where they fortunately were rescued. Intensive Training, Lightning Reflexes, Scholar (automobile mechanics). 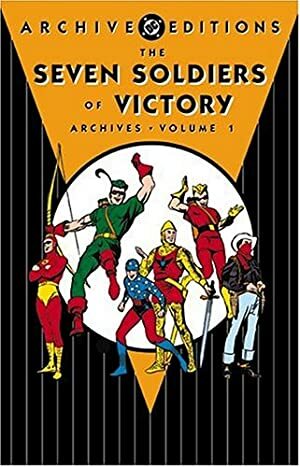 All-star Squadron (Low), Seven Soldiers of Victory (High), Crimson Avenger (High). Mistrust (first year), Secret ID. 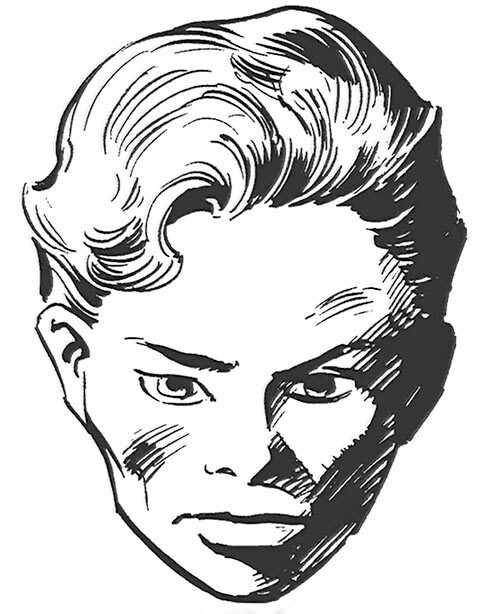 Source of Character: DCU (old Detective Comics).